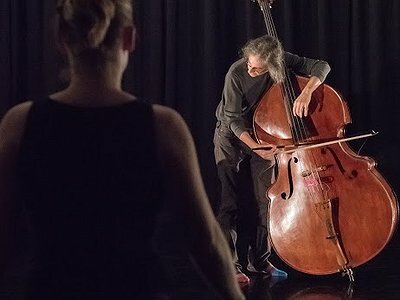 Musical Recommendations: I recently saw the fine young double bassist Matt Kline performing a demanding work for double bass, soprano and tape by composer Lewis Nielson. The work drew on a whole spectrum of techniques for the instrument and was performed in a profoundly musical—as opposed to purely technical—way. It was wonderful to watch. Dario Palermo is a Milanese composer who does fascinating work by integrating new technologies with acoustic instruments and voice. He’s done a long work for amplified string quartet, mezzo soprano and electronics that plays quite effectively with the strings’ timbral range and with textures of varying saturation and density. Website / Contact: If you enjoyed this interview with Daniel Barbiero, you can find more information and current news on his website. It seems like I’ve been composing ever since I’ve been conscious of music as something one could compose—as opposed to something that was just out there, in the air--whether or not I actually knew what I was doing. The urge to experiment with creating objects out of sound has always been very strong, and predates my having the conceptual vocabulary to be able to articulate that thought. And it’s proceeded along two parallel lines. The first is purely pragmatic—the need to have material that can be used for performance, generally as launching points for improvisation. The second is more concerned with exploring specific problems or concepts—a kind of counterfactual, or “what if?” approach to organizing sound. This latter approach grows directly out of my very earliest fascination with composition. It’s never left me, really. My early musical influences were fairly eclectic. I became aware of music as something of more than passing interest while in my preteens; my tastes began developing very quickly after that. I listened to rock music, but it didn’t really give me what I was looking for; fortunately there were other things out there to discover. It was an interesting time to become engaged with music—the early-to-mid 1970s, when radio was a vital element in discovering new sounds, and when you could find college stations or the remaining progressive FM radio stations that would play free jazz, Berlin-school electronic music, avant-garde art music and just about anything else. I remember quite vividly the epiphanies I had on hearing Tangerine Dream’s “Zeit” and John Coltrane’s 1966 version of “My Favorite Things” on the radio when I was fifteen or sixteen years old. I was also buying a lot of LPs; at about that time I got a recording of Milton Babbitt’s “All Set,” which left a deep impression. I didn’t understand it, but I liked the sound—the textures and colors above all. Those kinds of things were enormous influences in forming my sense of what music should sound like—what sort of overall shape a piece should have, for example, or what kind of timbral and textural relationships it could contain-- regardless of whatever the underlying structures might be. I also developed a sense of what music should look like. I remember leafing through a friend’s textbook on the history of western music when I was a junior in high school; towards the end of the book there was an excerpt from the score for Penderecki’s Threnody for the Victims of Hiroshima. I immediately thought it was the best musical work I encountered, although it was several years before I actually heard it. The visual effect of the score was very powerful—the unorthodox symbols and the gestures they signified absolutely intrigued me. They indicated that there was a universe of sounds out there beyond pitch—something I was also learning through some of the music I was discovering. When I got home that day I “composed” a piece based on whatever symbols I could remember. That was the beginning of my ongoing interest in graphic scores and the possibilities they hold, both as visual works in their own right and as guides to performance choices. Well, I don’t think that my phase of learning is over yet! And probably it never will be. I’m still discovering things about sounds and their relationships, partly by taking the suggestions that come to me from watching or hearing performances by others. Misreading I think is an important element here—trying to emulate another and yet failing in a creative way, a way that fails precisely because something irreducibly one’s own intervenes and turns the attempted imitation into something original, or at least something that has to be taken on its own terms, whatever those may be. It can even be a matter of seeing something ostensibly familiar from a new perspective—one learns something new about something that might otherwise be habitual. It’s kind of like what Heidegger describes as the shift in perspective from the ready-to-hand to the present-at-hand: One suddenly notices something one took for granted as having its own objective qualities and indeed a separate existence from whatever uses one has for it. And there’s also this: I haven’t been trained in traditional composition and so have had to come up with my own ways of doing things, to a large extent. Call it a kind of a forced originality. That said, there’ve been many performers and composers I’ve looked to for hints as to how to do things, how to make things sound—sometimes, what stance to take in relation to music in general. My own voice, to the extent that it’s emerged, is the result of an ongoing critical operation. Other people’s works will engage me and push me to come up with a response, one involving a kind of assaying or testing of the moving parts. It’s a process of suggestion, refutation and countersuggestion--a dialectic in the Platonic sense, I like to think. At the beginning, the most important challenge was also the most elementary one: Coming up with a way of selecting and organizing basic material. What I was looking for was something that would fall outside of the more conventional structures of theme and variation or tonic-dominant—what Pierre Schaeffer called “do-re-mi”—but that would nevertheless start with motivic material subject to some kind of transformation. This meant finding the right conceptual approach, which turned out to entail recognizing the importance of timbre and of organizational properties other than line, counterpoint and harmony—to think of horizontal and vertical structures in more abstract ways, I suppose. I also wanted to compose in a way that would allow performers wide latitude in interpretation. I’ve always liked Harold Rosenberg’s description of a painting as not so much a fixed set of events but rather a field in which the painter acted, and I wanted my compositions to be that way as well. At the same time, I wanted to produce work that would retain some kind of self-identity or distinct characteristics of its own, some fundamental constant undergirding different interpretations. Tied in with all of this was the question of notation—what kind of notation would be most effective in fostering this kind of constrained freedom? Not having been trained in conventional composition and notation I had an advantage in that regard—or could turn a deficit into an advantage—in that I was open to graphic and verbal notation, both of which I use extensively, although not exclusively. In a way, ever since I’d seen the excerpt of the Threnody, graphic scores were the answer I was always looking for; it was just a matter of finding the right question to ask and the right circumstances for asking it. Although I’ve settled on the kinds of notation that work best for me, the challenge inherent in the open composition’s offer of constrained freedom remains. My earliest writing was for my own use, but writing for others made me more aware of the essentially consensual, good-faith relationship between the composer and performer of an open or indeterminate score. I’m very fortunate to work with performers who understand this relationship intuitively—performers such as Gary Rouzer, the musicians of The Subtle Body Transmission Orchestra, Sarah Hughes, Luke Stewart, Scott Forrey, the New Ting Ting Loft group, Perry Conticchio, Rich O’Meara, and others who’ve realized some of my graphic and verbal scores. My work space is in my house. I record in the living room—I only half-jokingly call it Last Resort Studio—and have a computer set up in the basement for working with the recordings. My biggest ergonomic concern there is keeping the cat off the keyboard. But writing I can and will do anywhere--I don’t go anywhere without a notebook. My attitude toward technology has always been pragmatic: If it’s useful I’m happy to use it. Because everything is technology, from the audio editing program, to the granular and analogue synthesizer apps I occasionally use, to the notebook I’m never without, to my instrument—a double bass modeled on a 1701 Matthias Klotz busetto bass, which I’m sure was high-tech in its day. Technology is just equipment, and equipment is ready-to-hand, there to use. Mood is something a little more subtle, yet pervasive and extremely important because of that. For myself, I like to work in subdued environments. "It seems like I’ve been composing ever since I’ve been conscious of music as something one could compose."